Cavaliers come calling at Wayne High Wayne Memorial High School in Michigan will be hosting the Cavaliers for two days this summer and preparations to make them feel welcome during their visit are well underway, the Observer and Eccentric newspaper of Detroit, Mich. reported. The Cavaliers will rehearse for two days there before heading to Toledo, Ohio for the Glassmen All-Star Review on June 25 at the University of Toledo. Read the article at HometownLife.com. Education secretary receives arts petitions The Rally for Music Education in Washington D.C. on June 18 caught the attention of the Associated Press as actor Florence Henderson presented Education Secretary Arne Duncan with petitions bearing more than 120,000 signatures of music education supporters. The rally and petitions were the work of MENC: The National Association of Music Education and part of Music Education Week. The Glassmen Drum & Bugle Corps and an after-school rock band from an elementary school in New York performed at the event. Read the AP article. Read more and see photos of the event on the U.S. Department of Education blog. National ensemble coming to Brazil Marching band students in Brazil, Ind. 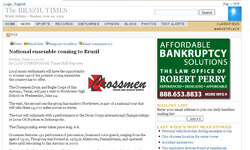 will have a chance to "witness their style of performance on a much grander scale," the Brazil Times reported, as the Crossmen visit Northview High School on Wednesday, June 24 and hold open rehearsals. Crossmen Executive Director Fred Morrison noted that the rehearsals are a great way to see and celebrate extremely hard-working students who are often overlooked. Read the article at TheBrazilTimes.com. 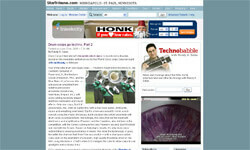 Drum Corps go techno, Part 2 In a continuing series about Drum Corps International's new rule change that allows electronics to be used on the field, a Minneapolis Star Tribune blogger wrote that DCI's "foray into electronics is mostly not a disaster" after seeing the Stillwater, Minn. show, Drum Beauty. Read Randy Salas' opinion of the corps' use of electronics.